(Phys.org) —Saving energy is crucial to the survival of animals living in the cold regions of the world. A small marmot-like rodent from the Arctic is world champion when it comes to energy saving. According to Jun Yan from the Partner Institute of the Max Planck Society and the Chinese Academy of Sciences (CAS) in Shanghai, this makes the Arctic ground squirrel extremely suitable for studying the changes that occur at molecular level during rodent hibernation. Based on this, the scientist and his colleagues aim to discover exactly how the animals can attain such dramatic reductions in their metabolic activity. Almost all of the life around Lake Toolik in North Alaska comes to a standstill on the arrival of winter. At temperatures of minus 50 degrees, icy storms sweep across the snow-covered mountain slopes and the country descends into the darkness of the polar night. The fact that animals can survive in these extremely hostile conditions is nothing short of miraculous. Some of them only survive this period by drastically suppressing their metabolism: they simply sleep through the winter in snow caves or underground lairs. The Arctic ground squirrel (Urocitellus parryii) is one of these survival artists. This small rodent, however, has taken energy-saving to extreme: it can reduce its metabolism to one or two percent of its normal rate. When these animals, which are found in Canada, Alaska and Siberia, have acquired sufficient fat reserves in autumn, they withdraw deep into their burrows and prepare for a long period of rest. Their hearts work at a gradually slower rate until they beat only once per minute. Their brains shut down almost completely and convert to a kind of stand-by mode. Their body temperature declines from 37 degrees to minus 3; however, their blood does not freeze. This makes them the animal kingdom's unchallenged record-holders for lowest body temperature. They can survive like this for up to eight months. During this period, the ground squirrels only wake up twice per month for a few hours. It appears that without these short arousal phases, their brains would suffer irreversible damage. This extreme metabolic adaptation makes the Arctic ground squirrel the perfect object of study for Jun Yan, a scientist from Shanghai. Yan has been working closely with Brian Barnes, a scientist from Institute of Arctic Biology in Fairbanks Alaska on the hibernation of Arctic ground squirrel. 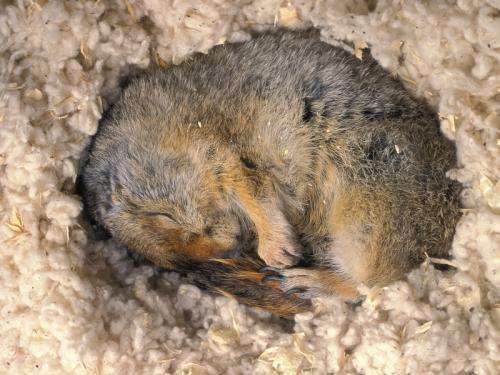 Several dozen of these small rodents live in the laboratory at the Institute of Arctic Biology in Fairbanks Alaska and enjoy 16-hour light and 8-hour dark days at an indoor temperature of 20 degrees, over the course of which they feed on high quality rodent food, apple slices and carrots. For their studies, they reduce the temperature in the laboratory to 5 degrees and switch off the light every day after just four hours. This gives the squirrels the signal to prepare for their winter sleep. While the animals sleep, the researchers take tissue samples and analyse their gene activity and protein volumes. In this way, they discovered that the squirrels boost or suppress the production of many proteins during hibernation. With the help of mass spectrometry, the scientists identified over 3,000 proteins in the animals' livers. Production of approximately 500 of these is increased or decreased during winter: Fewer of the proteins used to break down carbohydrates and form fatty acids are available during hibernation, while more proteins are formed for breaking down fatty acids. "This enables the animals during the long winter months to make use of their fat reserves to obtain energy. In summer, they need these proteins again for the digestion of plant food sources and for the production of fats for the following winter," explains Yan. The tests carried out by the researchers also show that it is often impossible to draw conclusions about the volume of a given protein from the prevalence of a messenger-RNA. These molecules are the transcripts of genes and provide the basis for proteins. Accordingly, the activity of a gene does not necessarily have anything to say about the extent to which the corresponding protein is formed. Consequently, the squirrels must use other possibilities to regulate their protein production during hibernation. For this reason, the scientists examined so-called microRNA molecules (miRNAs) in greater detail. These small molecules, which have only 19 to 25 base pairs, can block the messenger RNAs. In this way, the miRNAs can hinder the formation of proteins themselves even though their genes are active and read. Thus, miRNAs are important regulator molecules, with which an organism's different cell types control protein production. 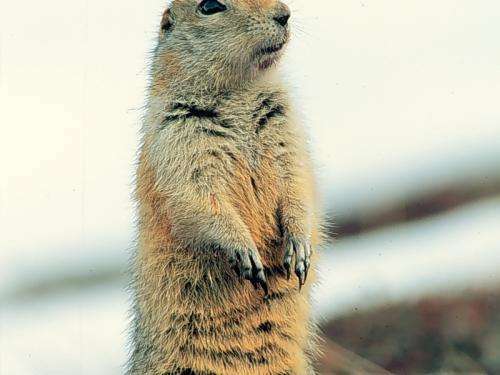 Jun Yan and his colleagues discovered over 200 miRNAs in the liver of the Arctic ground squirrel alone, of which 18 were previously unknown molecules. The extent to which a miRNA is formed depends on whether the animals are hibernating or not. For example, far fewer of the molecules are formed in the liver during the sleep and arousal phases. In contrast, others arise in large volumes – but only when the animals are actually asleep. The values decline again during the short wake phases during hibernation. "Our analyses showed that some of these miRNAs control cell growth. We assume that the animals can prevent the formation of tumours during hibernation in this way," explains Yan. As a next step, the researchers compiled a comprehensive genetic profile of the Arctic ground squirrel during hibernation. Approximately 500 genes are activated during this period. "This is the genetic signature of hibernation in these animals," says Yan. To find out more about the function of these genes, the scientists compared them with genes that are switched on in mice during periods of starvation, sleep deprivation and vascular disorders. Although each of these states differs from the physiological conditions of hibernation, the squirrels experience them in a similar form during hibernation; the corresponding genetic profiles overlap accordingly. Hence, the fluctuations in the activities of genes during the transition from sleep to wake phases during hibernation correspond to those that arose in the mouse genes in response to day-night fluctuations and low ambient temperatures. Based on this, Yan and his colleagues established that mice which consumed only 10 to 40 percent of their normal calorie intake for weeks or months switch some of the same genes on or off as those activated or silenced by the Arctic ground squirrels during hibernation. For example, genes for the formation of the energy-storage carbohydrate glucose are activated in both cases; in contrast, genes for the production of fatty acids are silenced. It appears that the transcription factor PPARα is involved in this change in fat metabolism. PPARα accelerates the breakdown of fatty acids and inhibits the formation of new energy-consuming fat molecules. In contrast to this, fat metabolism is not altered in the case of vascular disorders. In the torpor phase during hibernation, little or no blood circulates in the squirrel's various tissues. During arousal phases, the blood flow increases significantly, similar to the way it increases during a heart attack or stroke. "Unlike in the case of a heart attack, however, this increase in circulation does not cause any tissue damage in the sleeping ground squirrels. We assume that the raised fat metabolism prevents such damage." Moreover, the genes that equip proteins with ubiquitin attachments, and thus release them for the cell's decomposition machinery, remain active in the squirrels during hibernation. 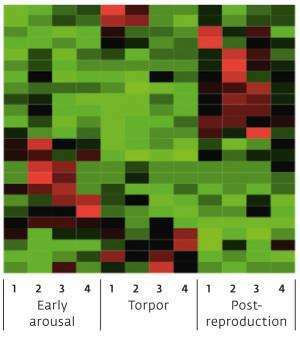 These genes, however, are significantly less active in mice following undersupply with oxygen. The hibernation of the Arctic ground squirrel is therefore not only fascinating for zoologists, it can also teach researchers a lot about the human body and diseases. "The Arctic ground squirrels appear to survive long phases without food, at low body temperatures, and with restricted oxygen supply and blood circulation without coming to any harm. The knowledge about how they manage this could one day lead to new treatments for cardiovascular disorders, cardiac arrest and strokes," says Yan. There may be potential for use of this knowledge in long space voyages in which astronaut DNA is altered to allow them to enter a hypersleep or genetically-engineered hibernation similar to what these squirrels experience. Coupled with a sufficiently speedy craft, astronauts could go to sleep after leaving the Moon launch outpost and awaken when approaching Mars. For them it would be just a short trip, with the brief monthly awakenings required during the voyage to keep their brains from being damaged. Much less food would be required for the round trip. On-board computer monitoring would awaken them if a problem occurred that needed their attention, or if their health indicated the need for an unscheduled awakening.